Update: On Tuesday, February 18, Pittsburg sent a letter to WesPac, reopening the comment period on the environmental review process for the project. The comment period had initially closed in September, 2013. This step will prolong the approval process for the project. And on Friday, February 21, the AP reported that railroads that haul crude oil had reached an agreement with transportation officials to adopt increased safety measures. 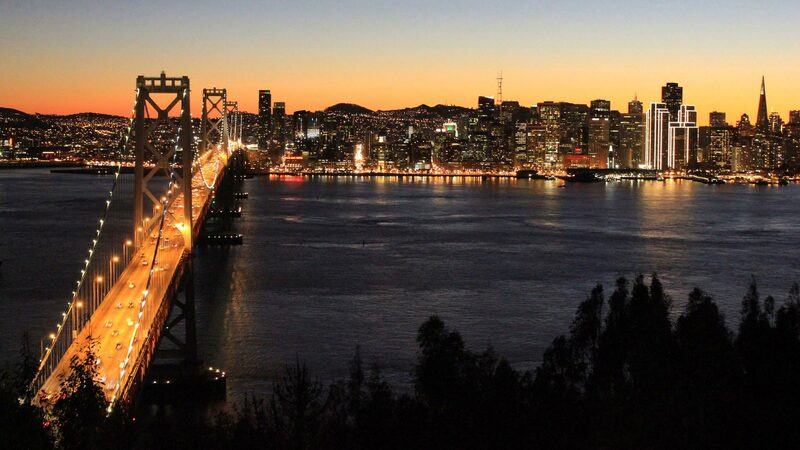 Original story: The city of Pittsburg, 20 miles east of Oakland, is considering approving a new oil terminal to supply crude to Bay Area refineries. The oil would come via ship, pipeline and railroad. But there have been a number of recent accidents around the United States involving rail shipments of crude oil, and some locals are concerned about the safety of the project. On a Saturday morning in January, about 150 people gathered at a playground in Pittsburg. Greg Osorio, a local pastor stepped up to a microphone and got the rally started. "They want to put a dynamite factory in our backyard with crude oil bombs," he said. "Right next to housing. Turn around and look at that." A cluster of faded yellow metal oil tanks sit just behind the park. Each one is the size of a house. Right now they’re empty, and have been for 15 years. But they soon could be filled with crude oil. 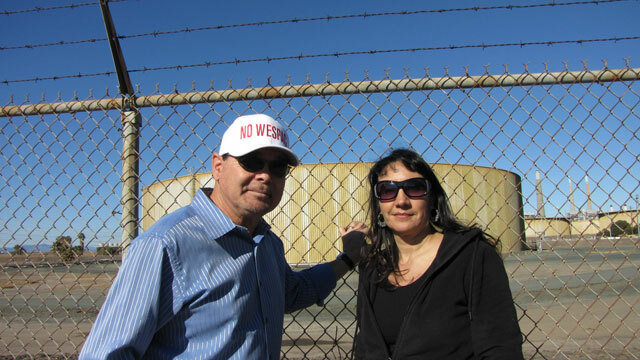 WesPac, an Irvine-based company, is proposing to re-open and upgrade the tanks. The property, which includes a power plant that's still in use, once belonged to PG&E and is now owned by an energy company called NRG. WesPac wants to take over the tanks to bring in oil, store it and redistribute it to Bay Area refineries to make into gasoline, diesel, jet fuel and other products. The $200 million project would be able to store up to 375,000 barrels of oil in 17 tanks. "It’s consistent with the types of operations that are going on in that area already," said Art Diefenbach, the project manager for WesPac. This is an existing facility in a traditionally industrial town, he says, so the project makes sense here. After the tanks were decommissioned, neighborhoods grew up around them, but Diefenbach says that won’t present a problem. "We’ll be installing additional safety equipment and noise reduction equipment and air pollution control equipment so that it’s actually going to be better than it is today," he said. Better, he means, than sitting empty. Plus, the project would create up to 40 permanent jobs, though those wouldn't be guaranteed to Pittsburg residents. But community members aren’t just concerned about the oil in the tanks; they’re also concerned about the trains that would deliver it. 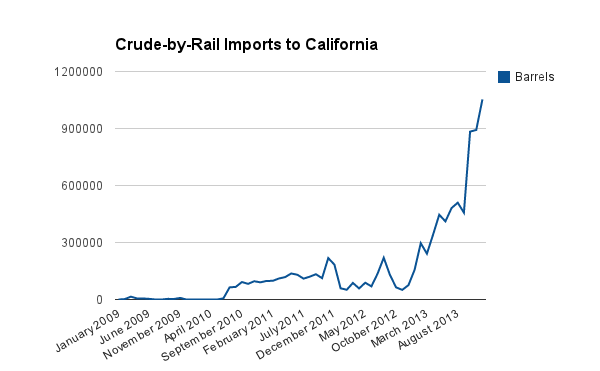 Barrels of oil coming into California by train, 2009-2013. Data from the California Energy Commission. In 2008, there was no oil coming into California by rail. Last year in December alone, trains carried more than a million barrels into the state. That’s because there’s an oil boom in North Dakota and Canada, explained Tupper Hull, the spokesman for the Western States Petroleum Association. "The problem that we have is, there’s not a terribly good infrastructure to get oil to the coasts where most of the refining and frankly most of the customers are, for that energy, located," he said. Without pipelines, oil companies are turning to trains. While crude delivered by rail accounts for a little less than two percent of all the oil California uses now, that may be changing. 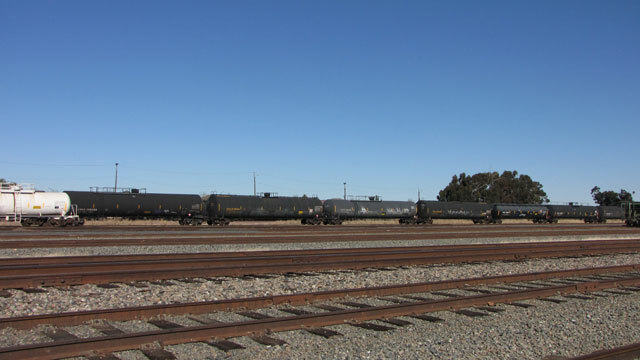 WesPac is one of six crude-by-rail projects being considered in the state. If they all get approved, rail could provide a quarter or more of California's oil, according to the California Energy Commission. But more crude-by-rail has led to more crude-by-rail accidents. Last summer in Quebec, 47 people died when an oil train exploded. In the past four months, there have been derailments in Pennsylvania, North Dakota, Alabama and New Brunswick, Canada. "People here are concerned about that happening," said Andres Soto, an organizer with Communities for a Better Environment. "They’d rather prevent it than respond to it." Pittsburg is a city that's weathered industrial catastrophes before. In 1944, 320 people were killed when two Navy munitions ships in nearby Port Chicago exploded. Andres Soto says he thinks oil companies aren’t being transparent about safety concerns. "They don’t want to admit the risk," he said. "Because if they did, the community would say, 'Not in my backyard.' And the people have a right to say that." There have been some responses: The National Transportation Safety Board is making recommendations to improve crude-by-rail safety; Governor Jerry Brown’s budget proposal boosts funding for the agency that cleans up oil spills; Attorney General Kamala Harris wrote a letter to the Pittsburg planning department, expressing her concerns about the WesPac project, particularly the impacts on air quality and the risk of accidents. Tupper Hull says the companies he works with are aware of the safety concerns, and he expects there will be more regulations. "We’re in one of these eras where the market has brought us good news, and now we’re catching up on the regulatory and the infrastructure side." Good news, he said, because this is domestic oil—rather than from overseas—and it's cheap. Lyana Monterrey, a Pittsburg resident and one of the people leading the charge against the project, isn’t buying it. "Not here," she said. "Not next to a community. You don’t sacrifice people, community for your profits. That’s wrong. That's an injustice." The city of Pittsburg is currently considering the project. The city council is expected to decide on its fate soon. The oil tanks are the round shapes on the map.